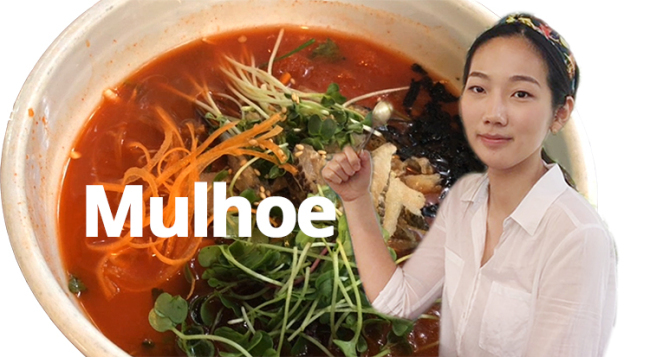 Mulhoe, cold raw fish soup, is a summertime delicacy in Korea. The dish could be described as sliced raw fish in cold soup with vegetables, or sliced carpaccio in seasoned broth. Though mulhoe can be consumed throughout the year, it is often enjoyed in summer. The broth, chilled with ice, cools the seasonal heat. Flavored with red chili paste, the broth also awakens a sluggish appetite with its spicy, sour and sweet taste. The harmony of the sweetness of the fish and spiciness of the soup leaves a pleasing impact in the mouth. Various seafood can be used for mulhoe, including abalone, cuttlefish and conch. But the most often used are white fish such as flatfish, bass or pearl-spot chromis. Only the freshest fish should be used. Usually, sashimi or Korean seafood restaurants serve the dish. In front of the stores, fish tanks are showcased, assuring diners the fish on their table is as fresh as can be. Restaurants typically offer the choice of rice or noodles to accompany mulhoe. After devouring the fish and vegetables, diners can supplement themselves with the carbs, adding rice or noodles in the broth. Though many assume mulhoe is made by putting the fish slices in the flavored broth, the fish is first seasoned with sauce. Then, the water is poured over the seasoned fish. Mulhoe, like many any other seafood dishes, originated in coastal cities on the east coast and Jeju Island. It is a go-to dish for fishermen quickly fixing a meal aboard their skiffs. Chili paste broth is more common these days, but Jeju Island still mainly uses soybean paste to make the broth. Without the spice, the broth is savory, with a deep, rich quality. Mulhoe costs from 10,000 to 20,000 won ($9-$18), a relatively cheap fare compared to other raw fish dishes.